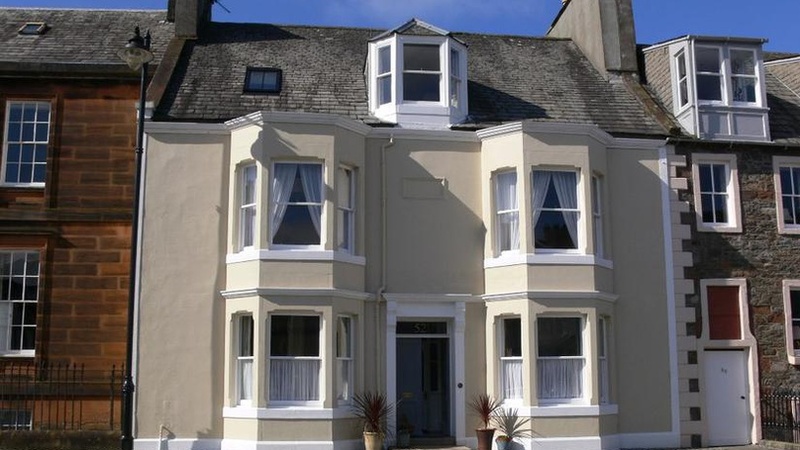 Located in the harbour town of Kirkcudbright this townhouse is steeped in history and was formerly The King's Arms Inn', which was frequented by Robert Burns and even includes an inscription on one of the walls believed to be from the poet himself. 52 High Street has now been launched to the Dumfries and Galloway market through Scotland's leading property consultants CKD Galbraith and offers buyers the opportunity to own a piece of local history as well as a superb family house. William Robson had the inscription preserved on the bedroom wall, where it remains today. Whether or not this is truly a Burn's inscription remains somewhat a mystery however the town's strong links to Burn's speaks for itself. The town's peaceful atmosphere is believed to have inspired other famous versus from the poet such as the Selkirk Grace, thought to have been written whilst he stayed at the Selkirk Arms Hotel in Kirkcudbright. 52 High Street has been sympathetically renovated and modernised since its purchase by the current owners in 2012 and is a lovely five bedroom family home with large dining kitchen. The property is listed and retains many original features including high ceilings, an elegant staircase, ornate plaster work and decorative wood panelling. David Corrie, head of residential sales at CKD Galbraith's Castle Douglas office, said: "This is an immaculately presented home of character and history, with the principal rooms being elegantly proportioned and offering different layout options as well as flexible accommodation for a large family. "Included in the sale of 52 High Street is a substantial stone outbuilding which would make for an ideal artist's studio, surrounding gardens and an Edwardian rotating summer house. "The property's history is fascinating and offers another interesting and quirky feature to an already impressive house. As such we expect interest in the property from across Scotland and south of the border as the region continues to attract buyers looking for more value for their money." Kirkcudbright was a magnet for many well-known artist in the late nineteenth century and became famous as Scotland's Artists' Town. It is a very popular tourist destination in the summer months with a range of festivals and events taking place such as the annual Art and Crafts Trail, the Kirkcudbright Jazz festival and a busy farmers market which runs throughout the year. Dumfries is only 28 miles away and offers a wide range of amenities and attractions whilst Castle Douglas is a mere 10 miles away.